If your fear of getting sick while traveling is what stops you, please don’t let that be the reason for not seeing the world. If you are wondering how to stay healthy while traveling, there are many things that you can do to prevent getting sick. And in the case that you do get sick, there are many things you can do so that you aren’t sick for long. When we travel, we usually get sick because of contaminants in food or the water. But, just a change of environment is enough to upset the balance of “friendly bacteria” in your body, which can also cause you to feel unwell. The first thing I do when I’m about to travel is prepare the way, so to speak. I make sure to keep my immune system healthy which makes it less likely that I will get sick. One of the ways that I do this is by drinking plenty of green juice. Juicing helps absorb all the nutrients from the vegetables. And, I feel a huge difference when I don’t get my juice each day. There are even some companies I have found that will ship green juice right to my hotel room for free. Then, my green juice is waiting for me when I arrive. Also, while you should be careful with what you eat while traveling, you don’t have to let your concerns prevent you from trying the local foods. After all, this is a huge part of the joy of travel. Of course, if you are in areas where it’s not suggested to drink the local water, then don’t. You should also stay away from ice in foreign countries, as it’s often made with dirty water or handled with dirty hands. I hate to say it, but if you are really intent on staying well, than you should avoid ice cream as well. I used to get sick quite often when I traveled, not realizing that ice cream is a breeding ground for bacteria. Many times, especially in other countries, it is not kept cold enough to kill bacteria that can be growing. I love ice cream, so it was very upsetting for me to discover this information, but not as upsetting as being sick from it. Of course, when food is at a hot enough temperature, it kills the bacteria, so always make sure that the food is served hot. Many people are afraid of eating at street stands, but actually this is one of the safest ways to get your meals. Of course, you want to make sure there aren’t a lot of flies swarming around the food, but think about it. The street food vendor is only buying and bringing the food he will cook for that day. In many restaurants, you don’t know how long the food has been there. Plus, when you eat at a street stand, you are watching the person prepare your meal, and the food is served right away, right when it’s hottest. You also don’t want to eat raw vegetables that can’t be peeled. For one thing, many vegetables are grown in contaminated soil and the dirt is easily trapped in the crevices and can be hard to thoroughly wash away. This is another reason I like getting green juices shipped to the area I am staying at. This way, I can still get my nutrients. Now, what to do if you do happen to get sick? Well, I like to visit the doctor before I got and get a prescription for an antibiotic. Ciprofloxacin is a good one, but is not very effective in many Asian countries, so another good one to get is tetracycline. If you don’t get them before you leave, many pharmacies have these available over the counter in foreign countries. Also, while you are traveling about, don’t forget to exercise. Exercise does wonders for building your immune system. Pack a jump rope in your suitcase, go walking, dancing, or hiking. Yoga is always a great way to stay flexible and in shape while traveling, and many locations offer classes right on the beach. And above all, stay hydrated. I make sure that I’m carrying a bottle of water wherever I go when I travel. Usually the temperatures are hot, and it’s very easy to become dehydrated. I also drink as much coconut water as I can find. 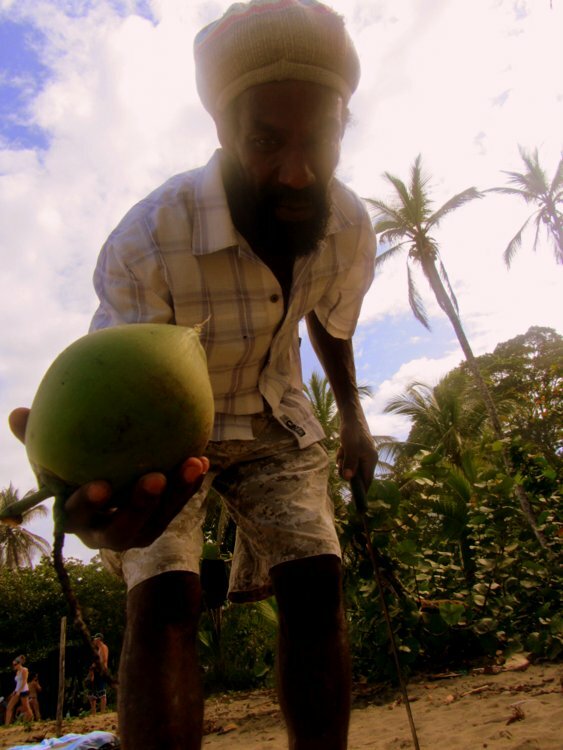 The electrolytes in coconut do wonders for the body. Especially, if you do get sick, nothing will make you recover faster than drinking the water from a couple of fresh coconuts. Lastly, this is why it’s so important to buy travel insurance for your holiday. A good policy will offer holiday compensation if you get sick. A few days out from your trip because of illness can ruin your entire vacation. Having insurance that covers that will give you peace of mind. Knowing how to stay healthy while traveling isn’t hard. Just be conscious about what you eat and drink, make sure you allow time for rest, and stay hydrated!! For more on what to pack with you when traveling go here. Do you have tips for how to stay healthy while traveling? Let me know in the comments below! Great tips Val! Fortunately for us right now ice is pretty safe here in Nica. I’d add probiotics to list found in Komboucha or supplement form at least 25 billion active cultures. We have several expats making and selling Komboucha locally at very reasonable prices. Fresh ginger is often grown in tropic vacation spots and good to consume before, with or after meals. Tastes great in cocktails too! . Great advice, Paul!! Yes, how could I have forgotten kombucha? I make my own: flavors like vanilla chai, orange spice, and, yes, hibiscus ginger!! I also do a lot of bodyweight exercises where ever I am staying to ensure that I stay fit. I can really tell the difference when I go a few days without doing them, so I try to make it a priority first thing in the morning.